King George II at the Battle of Dettingen, with the Duke of Cumberland and Robert, 4th Earl of Holderness, 27 June 1743. 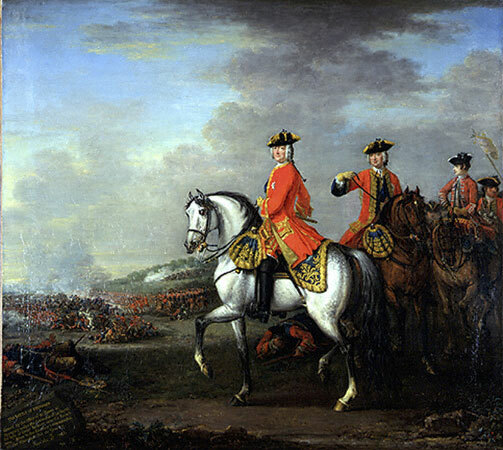 The first battle of the War of the Austrian Succession – Dettingen 1743 – was also the last occasion upon which British troops were commanded in the field by their monarch, in this case George II. The British with their Hanoverian and Austrian allies were outmanoeuvred by the French and found themselves trapped between the river Main and forest-covered hills with the French in front, behind and across the river. Fortunately, errors by the French gave the British and their allies a chance to fight their way out when the French force blocking their march launched an unnecessary attack. It is generally stated that the platoon firing of the infantry pretty much fell apart with every man firing in his own time, despite which the British and their allies were able to achieve a notable victory over the French. The main source for this assertion is a letter from Lieutenant Colonel Russell of the Guards in letters to his wife. That the Austrians also behaved well is also true; that except one of their battalions which fired only once by platoons, they all fired as irregular as we did; that the English infantry behaved like heroes, and as they were the major part of the action, to them the honour of the day was due; that they were under no command by way of Hide Park firing, but that the whole three ranks made a running fire of their own accord, and at the same time with great judgement and skill, stooping all as low as they could, making almost every ball take place is true; that the enemy when expecting our fire, dropped down, which our own men perceiving, waited till they got up before they would fire, as a confirmation of their coolness as well as bravery, is very certain; that the French fired in the same manner, I mean like a running fire, without waiting for words of command, and that Lord Stair did often say he had seen many a battle and never saw the infantry engage in any other manner is as true. Our people imitated their predecessors in the late war gloriously, marching in close order, as firm as a wall, and did not fire till we came within sixty paces, and still kept advancing; so that when we had soon closed with the Enemy, they had not retreated: for when the smoak blew off a little, instead of being among their living we found the dead in heaps by us; and the second fire turned them to the right about, and upon a long trot. In his official report Colonel Duroure not only gave his account of what happened, but also made mention of how the infantry had been ordered to fight. It was ‘judged that the whole fire had been given without Orders, against the Directions to preserve ours, and first to receive the Enemy’s, then giving ours and charging with Bayonets’. A clear statement that if Dettingen had been won by firepower alone that had not been the intention. At Dettingen the French cavalry enjoyed an initial success against the British infantry. The French Household cavalry broke through the first line of British infantry, but did not cause it to retreat. Rather the words of Bland about the superiority of infantry over cavalry were vindicated when the grenadier company of Huske’s 32nd, in the second line, held off the cavalry while the battalion finished forming. Then, trapped between the first and second line of infantry, the cavalry were shot to pieces. 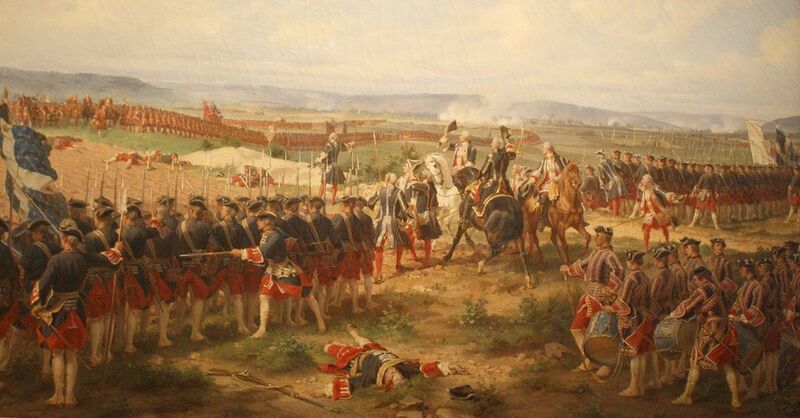 For events at Fontenoy in 1745 there is a French account of cavalry attacking British infantry. ‘Our Cavalry, which advanced before them immediately, could not sustain the terrible Fire made by that Line of Infantry . . . Several of our Squadrons rallied, but were again repuls’d by the prodigious Fire of the Enemy’s Infantry.’ Although Fontenoy was a defeat for the allied army under the Duke of Cumberland the British infantry more than held their own against both French cavalry and infantry. Following Dettingen the infantry had trained hard in their battalion firings, as shown by an order of 1 December 1744: ‘The Regt which fired ball against the wall of ye Capuchin’s near the Nonnen Bosh, are to do so no more, but to find some other place, if they have occasion to fire anymore.’ Whilst not a great deal of detail of the infantry battle at Fontenoy has come down to us, the notable exception to this is the firefight between the British and French Guards early on in the battle, when the benefits of such training were clear. Three battalions of British Guards were on the right of the first line of the British infantry attacking the French position. In an incident immortalised by Voltaire they came face to face with the French Guards, the Swiss Guards and the Regiment Courten. According to Voltaire, Lord Hay, a captain in the First Guards, stepped forwards and invited the French to fire first. A French officer responded, saying that they never fired first. The truth, as related by Lord Hay, was more prosaic. He saluted the French, toasted them from his hip flask and told the French he hoped they would not swim the nearby Scheldt as they had the Main at Dettingen, a reference to their rout at that battle. It is unclear who did fire first. Voltaire suggests that the French infantry were so stunned by the British fire that they did not fire at all. An account in a British newspaper stated that the French fired first. Whether they fired first or second the effect of the British fire was devastating. Voltaire says that the fire was by platoons and it seems most likely that the Guards fired twice by firings at a range of less than thirty yards. The total strength of the three guard’s battalions at Fontenoy was approximately 1,970 rank and file, meaning that the French received approximately 3,900 rounds of musket fire. Voltaire records this fire as causing a total of 912 killed and wounded, giving the Guards a hit rate of about 23 per cent. By contrast the three battalions of Guards suffered a total of 736 killed and wounded for the whole battle. The peace was broken by the outbreak in 1740 of the War of the Austrian Succession. The origins are complex and the campaign only concerns us because the expeditionary force sent to the Continent in 1742 included a Guards Brigade consisting of the 1st Battalions of all three regiments of Foot Guards. In 1743 King George II not only joined the army in Flanders but also assumed command. On 27 June 1743 he fought the Battle of Dettingen, well known as the last occasion on which a King of England personally led his troops into action. He led them, in fact, into a dangerous trap, carefully prepared by the French, and the situation was only saved by several gallant charges made by the cavalry, including, for the first time, a Household Cavalry Brigade. The Guards Brigade formed the rearguard and so was not involved in the battle until the later stages. The French finally suffered a severe defeat, losing 5,000 men, and Dettingen became the Regiment’s sixth Battle Honour. In 1745 the King handed over command to his 25-year-old son, The Duke of Cumberland, whose first action as a commander was the Battle of Fontenoy on 11 May 1745. Things did not go well and the Allied army was forced to make a frontal assault against the enemy centre, which involved an advance of half a mile across flat, open country under intense fire from their front and also from French strongpoints on both flanks. The Guards Brigade was on the right of the leading line, with the regiments in their customary positions, that is the First Guards on the right, the Coldstream on the left and the Third Guards in the centre. The brigade was commanded by Colonel George Churchill, Coldstream Guards. With shouldered arms the three battalions marched steadily forward, despite the fierce fire from three sides. Finally, as they topped a slight ridge, now seriously reduced in numbers, they found, thirty yards in front of them, four complete battalions of French Guards, as yet unscathed. 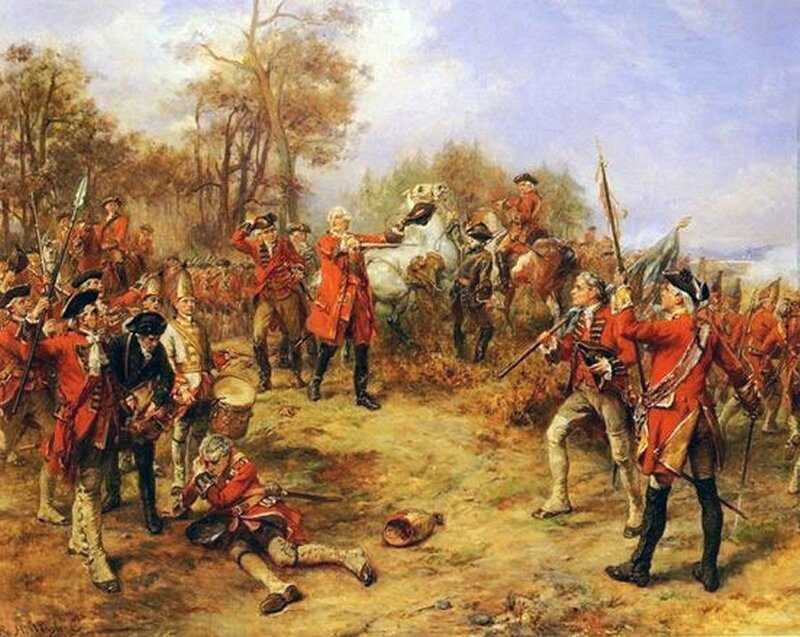 It was the first time that the British and French Guards had met in battle and it was a dramatic confrontation. The French fired first, but to little effect. Then the Guards replied and their first volley laid low nineteen French officers and 600 men. Steadily they reloaded, firing in disciplined sequence six platoons at a time, so that the volleys never ceased. Finally the French gave way and the Guards advanced. But they did not receive any support and found themselves isolated; for three hours they had to hold their positions against both infantry and cavalry attacks, but finally were forced to withdraw, having lost around half their strength. It had been a bloody and bitter defeat, and was not allowed to count as a Battle Honour, though it was perhaps deserved. On obtaining the summit of the ridge the allied column found itself facing the French infantry line. The French guards rose and advanced towards the crest, whereupon the two forces confronted each other at a distance of 30 paces. The moment was immortalised by Lord Charles Hay of the 1st Regiment of Guards who later wrote that he stepped forward, took out a hip flask and drank with a flourish, shouting out to his opponent, “We are the English Guards, and we hope you will stand till we come up to you, and not swim the Scheldt as you did the Main at Dettingen.” He then led his men in three cheers. Voltaire’s version of this famous episode has become proverbial. He wrote: “The English officers saluted the French by doffing their hats … the French, returned the greeting. My Lord Charles Hai, captain in the English Guards, cried, ‘Gentlemen of the French Guards, fire.’ The Comte d’Auteroche, then lieutenant of Grenadiers, shouted, ‘Gentlemen, we never fire first; fire yourselves. '” The French were the first to fire, the volley was somewhat ineffective but threw the Third Guards into some confusion and wounded George Churchill, the commander of the guards brigade. Captain Lord Panmure led the unbroken companies of the Third Guards to the flank of the First Guards. Up to this point the British column had not fired a single musket shot, but now the allied infantry poured a devastating discharge into the French. The volley of musketry with the battalion guns delivering numerous rounds of grape-shot, swept away the front rank of the ten battalions of the French first line, killing and wounding between 700–800 men, breaking the Gardes Françaises, while the Gardes Suisses and the four battalions of the Brigade Aubeterre were driven back by the British advance. Historian David Chandler writes that upon the order “first firing, take care”, in the British platoon firing system, the six platoons of the first firing with the whole of the front rank of each British battalion fired together – explaining the efficacy of the British first volley. Additionally, Chandler describes the advance as also a British development of the platoon firing system in which troops mounting an attack continue to advance to give fire by stepping out ahead of the rest of the marching battalion, when they are done and reloading the other platoons advance ahead of them and give fire in turn. This explains the slow advance of the column noted in many first hand accounts.